Posted on Sat, Dec 24, 2011 : 5:56 a.m.
Michael Kosta will return home to perform two comedy sets at Conor O'Neill's. 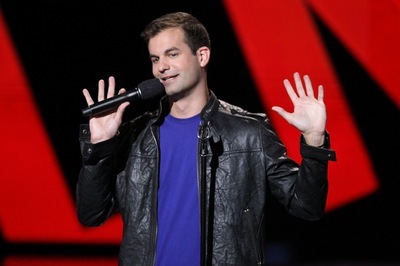 Ann Arbor native Michael Kosta—whose stand-up comedy has been featured on “Chelsea Lately,” “The Tonight Show” and most recently “Conan”—is coming back home for the holidays to headline two sets at Conor O’Neills (with openers Bill Bushart and Andrew O’Neal). But his first performance happened in town several years ago, at the Heidelberg’s Club Above. At the time, Kosta was making the leap from competitive tennis to comedy—not your typical career trajectory, to say the least. For after being a star athlete at Huron High School, and playing for championship teams at the University of Illinois, Kosta pursued a career in professional tennis for a while, and then returned to Ann Arbor to work as an assistant coach at the University of Michigan. Yet despite his sustained, intense focus on tennis, Kosta had also long fantasized about a career in comedy. “I had no thought that it could actually be a career,” said Kosta. “That I could do it forever and have it put food in my mouth. But it’s the kind of thing where—I once pulled out an old assignment from school, from when I was in 5th grade, and it was called ‘Who is Michael Kosta?’ and it said my dream occupation was to be a comedian. Kosta is the youngest of four children, and his parents—who left Ann Arbor to retire in New York City—play a semi-regular role in his comedy. For example, Kosta used to talk about how, when he left tennis to pursue comedy, he caught his mom reading a book titled “When Our Grown Kids Disappoint Us” (“That was in my act for a while, but I eventually took it out. It was a little too true,” said Kosta); and his second “Tonight Show” appearance, this March, included a bit wherein he read an e-mail from his dad word for word. Perhaps not surprisingly, Kosta’s first “Tonight Show” appearance marked a professional benchmark; but his first appearance on Chelsea Handler’s “Chelsea, Lately” was noteworthy for being one of the first shows to introduce him to a wider audience. What: Homecoming stand-up show, with Bill Bushart and Andrew O’Neal opening. Where: Conor O’Neills, 318 S. Main St. When: Friday, December 30 at 8 and 10 p.m.
How much: $15 advance, $20 at the door. Call 734-665-2968. And while there are some parallels between being a struggling young tennis pro and a stand-up comic—lots of travel; living hand-to-mouth; performing alone; etc.—comedians are generally known for maintaining a less-than-healthy lifestyle, full of late nights and junk food. How did Kosta make the transition? “It was hard,” he said. “I always tell people that I went from being a starving athlete that had to eat right and be in bed by 10 to being a starving artist that was up late and got free drinks. It was a struggle—it still is—but I’m cut from athletic cloth. That was my childhood, what I thought I wanted to be.